First up, something new and something not new but very worthwhile: The Scout charger and the Roku. The Scout, from IntelliArmor, comes in two versions: The Scout Max and the Scout Wireless. Both look pretty much the same, handsome and very slim devices with which you can recharge your smart devices on the fly, but the Wireless also brings wireless charging to the equation. 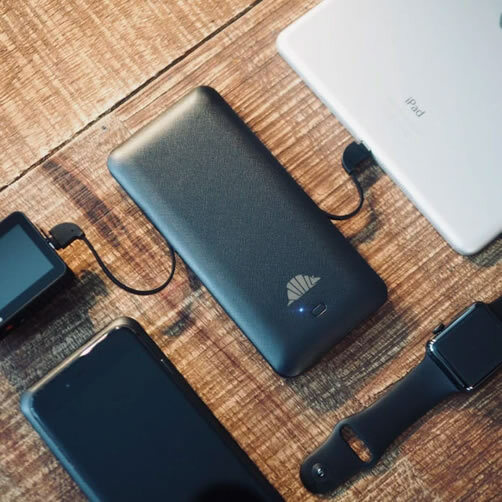 On the product's Indiegogo page, the company describes the Scout as the "world's Most Versatile Charger," noting that it comes "fully loaded with a built-in wall charger, built-in cables, quick-charging USB Port, and proprietary intelligent charging technology." And they aren't blowing smoke, either. The unit features a very nice, slim design and weighs in at a mere 9 ounces. Compatible with iPhones and Androids, as well as cameras and drones and stuff, the thing will fit easily into a pocket and thanks to its built-in cables you don't need to pack anything else with it other than the device you want to keep charged. Scout's built-in stuff is pretty all-encompassing for a current product: AC Plug and Micro USB Port (for charging the charger), and with outputs of a Lightning Cable, USB C Cable, Micro USB Cable and 2.1 Amp USB Port. I love the Scout's very slender body (wish mine were half as slim! ), which is only a little wider and thicker than an iPhone 6, and less than an inch taller. And its 10000 mAh capacity (though the wireless version only offers half that capacity) should be enough to charge your phone at least three times before the Scout needs its own battery bumped up. The cords tuck into the outside rim of the case beautifully, and are snug enough that they shouldn't get caught on something accidentally. They're a little awkward to use because of the way they bend out of the body for use, but it's definitely not a big deal and is, in fact, an acceptable trade-off. The cords are a tad short as well, but I can't imagine how they could make 'em longer without upping the overall size of the Scout. I love its integrated wall plug, too, which means you can slap it into an AC socket directly, with no extra adapters or cables to lug around (or lose). This could blow up in your face if you're traveling internationally, however, depending upon where you go. 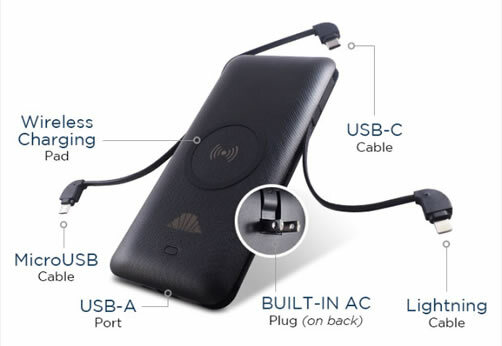 One thing you should note: when we tried it, the Scout didn't have enough amperage to charge my son's Apple laptop via USB-C, but since the product is aimed more at tablets, phones, etc., anyway, it isn't really surprising. According to the Scout's Indiegogo page, the product sells for $39USD, which isn't the cheapest you can find such devices but which will hardly break the bank. And since it works so well at its intended task, it could be cheap insurance for the device owner on the go. The recent holiday season gave my family and I a marvelous opportunity to recharge our own batteries as well as those of our smart stuff. Helping to encourage our sloth was the fact that my 98-year-old Dad came out to visit, then the grandkids got sick and then Dad came down with pneumonia. Put it all together and we had a marvelous, though unfortunate, chance to visit some old – and free – programming offered on the Roku system. It was eye-opening. I mean, I've been prattling about the wonders of the Roku for a couple of years now, with the caveat that I've never paid for any of the premium content offered via a dizzying number of apps, including stuff like Amazon Prime, Netflix, CBS All Access, etc. etc. etc.. Which means I've stuck to the free apps, of which there are many. Since Dad was around, we decided to see what old Christmas specials were available, stuff from when I was growing up during the 1950's and 1960's. And we certainly weren't disappointed! Not only was there an abundance of stuff available on YouTube, but I also discovered a couple of Christmas content apps that expanded the offerings substantially. Yep, we were in Christmas Special heaven! Thanks to YouTube, we watched Bob Hope in Vietnam, Andy Williams and his family, John Denver in Aspen, Dean Martin and his family, and much, much more. Audio and video quality were all over the map (most of this stuff predated VHS, after all, and I have no idea how the shows were archived), but revisiting Jack Benny buying Christmas presents, Frank Sinatra and Bing Crosby crooning together – well, it was a wonderful blast from the past and brought back wonderful memories of when I was a nipper still living in the bosom of my family. Then, when I switched over to the Christmas Music Channel, which I'd forgotten I'd installed the year previous, it opened up a whole new cornucopia of Christmas content! Not only were there many more old TV specials, but newer stuff as well – including a very entertaining Mormon Tabernacle show featuring John Rhys-Davies, and which also featured very good widescreen video and excellent audio. Since my Dad was a World War II aviator and is still a plane fan, we also accessed The Aviation Channel app, which offers an interesting variety of clips from most of the major aircraft manufacturers – stuff like assembly line video of Boeing building its commercial jets. And of course, there's more than that. Other apps offer looks at other niches, from car info and "man stuff" to news apps (and fake news apps, too! ), and even "Cat Clips Daily." You have an area of interest? There's probably an app for that. We also partook of my favourite music channel, Accuradio. Accuradio is available as a smart phone app and on the world wide web as well, and on those platforms, you can create your own customized playlists, which is a wonderful feature. Alas, on those platforms you also get some commercials, though they aren't particularly onerous. But the Roku app version has no commercials at all! The downside is that you can't create custom playlists and I really wish Accuradio would look into that. The upside is that there are so many different playlists in their huge music database that you can probably find something you like – anything from classical music to hip hop and just about every genre in between. And they add channels all the time, depending on the season. The interface is simple and the database of tunes is so vast it's my go-to choice for music – even before such other great apps as Tune-in (which, to be fair, offers a lot more than just music), Spotify, etc. The Accuradio audio quality is decent as well. Naturally they had an abundance of Christmas music channels, ranging from the usual standards to "more Avant Garde stuff". We also accessed the Roku Channel to find some watchable stuff. Like most of the "oldies" apps, your mileage may vary on what is, and isn't, worth watching but there's enough variety that you'll probably find something to catch your attention for a while. And as mentioned above, you can subscribe to premium channels such as Amazon Prime, CBS All Access, etc. The recent Fort Lauderdale Boat Show was broadcasted on Roku devices for the first time ever. Anyone watching the show was able to see several used Nordhavn Yachts for sale along with many boating safety lessons and tips. I have multiple Rokus in action and love how, once you've set each one up when you unpack them, they log into your account (you have to enter a credit card number up front, but I've never been charged for anything) and give you immediate access to all the apps you've installed on your other Rokus. Not only that, but you can tweak apps' location on each device, moving the ones you use most in that particular location to where you can get at them quickly. It isn't a big deal, but it's handy. For example, I use an entry level Roku in my bedroom, where we have an old LCD TV that we never use for broadcast television (there's no signal there), so we use it purely as a monitor for the Roku. And since we like going to sleep to Accuradio music, I moved that app to the top of the scroll, where it's nicely at hand. We fire up the TV, which powers the Roku via its USB port, and both devices leap into action. A bit of scrolling and clicking in Accuradio and we have the playlist we want, and then we use the TV's sleep timer and its "energy saving" mode (which shuts off the screen completely), to leave us with nothing but music by which to fall asleep. And after two hours, the TV shuts down, taking the Roku with it and leaving two (usually) blissfully snoring people. I love it. You also get a voice-activated remote control with the Ultra that you can use to search for programming, it has a headphone jack you can use for private listening from the remote (which cuts down on the length of cable you need for your headphones/buds), and features a "lost remote" finder feature. It's basically a way to turn non-smart TV's into smart TV's. I must admit I like using a Roku better than I like using the apps on my smart TV, though of course it requires an HDMI port you could need for something else: our old plasma, for example only has two HDMI ports, so I have to keep switching cables between my Blu-ray player and the Roku in that room. Fortunately, it's a minor annoyance and only takes about five seconds to accomplish. An external HDMI switcher could help here, too. 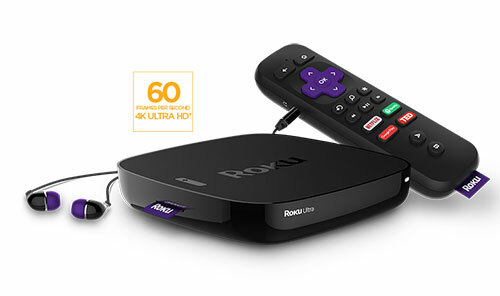 Roku isn't the only such device out there, but there are so many different Roku models with different capabilities and different levels of portability – let alone the dizzying selection of content available – that I think it's the most flexible platform currently available.